Goldilocks & Her Doodle: Sunday Fun Days! The ferns at my mom's house are tantalizing to both Milt and me. Currently at our Dallas home, we are attempting to grow about five ferns (not nearly enough!) as shade plants in our side yard in an effort to soak up some of our mud. Unfortunately, the ferns are not growing terribly quickly, and I always used our ferns in New York as a model, but I quickly forget that these are at least 40 years of growth planted by my grandmother. Oh well, I guess time does eventually pass, but with gardening, I am always looking for that instant gratification which never does seem to arrive! Milt collecting his ball from a cool respite. 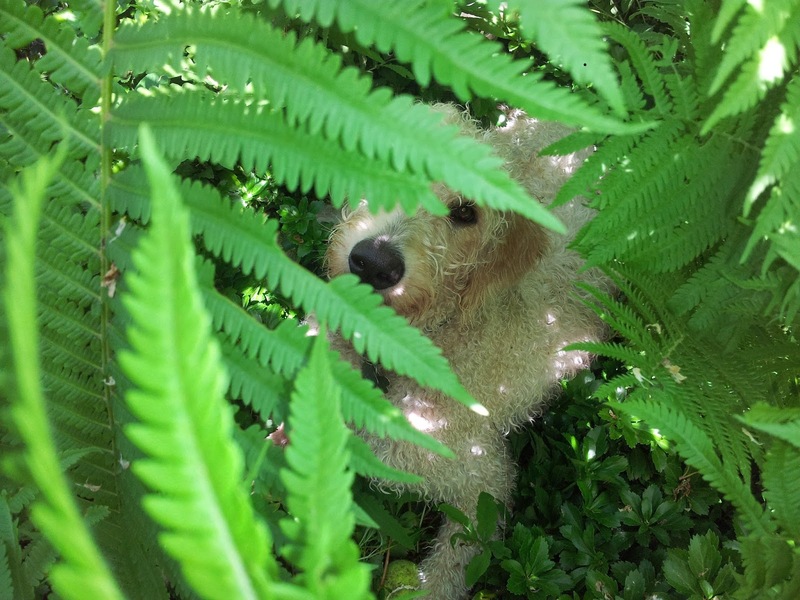 I am enamored by this lush photo of Milton the Goldendoodle because it reminds me of a famous line from a William Wordsworth poem: "Though nothing can bring back the hour of splendour in the the grass; of glory in the flower." To follow this poem's advice and a page from Milton's life -- Take time for simple beguilement, and if you find yourself someplace wonderful, linger and enjoy it. Lovely picture! Nature brings so much peace.